This addon keeps track of when a repeatable action can be repeated. Go into your keybinds and bind a key for Action Timer, which will have its font in the same color as you see here. This will toggle the window to see all the timers for each character. Initially, it will only show the current character, but, as you log-in to others, it will calibrate their clocks as well. If you experience a bug or have any feature requests, please let me know in the Issue Tracker on the Github Repository. Since I recently started playing Elder Scrolls Online for the first time, there will likely be much more to be desired, so don't be shy. You are welcome to make changes and submit them for review as a Pull Request in the Open Source Repository on Github. I don't see why it couldn't have all those. I'll look into it when I get some time. Ahem. That would be great, thank you! Because that would be pointless. Is it still broken? It's supposed to calibrate each character's timers when you log in as that character, and after switching to another character, it will still have that data to show. Considering the limitations of what Bethesda allows, I don't think there's a way around having to log in as each of these characters at least once to start it off. This sounds like a great addon if you could maybe include other timers such as dailies, random normals, trials, and battlegrounds. Is there any chance of including those? As it stands, with just the two features, I don't see getting much use of it. Thanks much! How do you make this addon work? The first version came a little before it was completely ready, per a user's request. 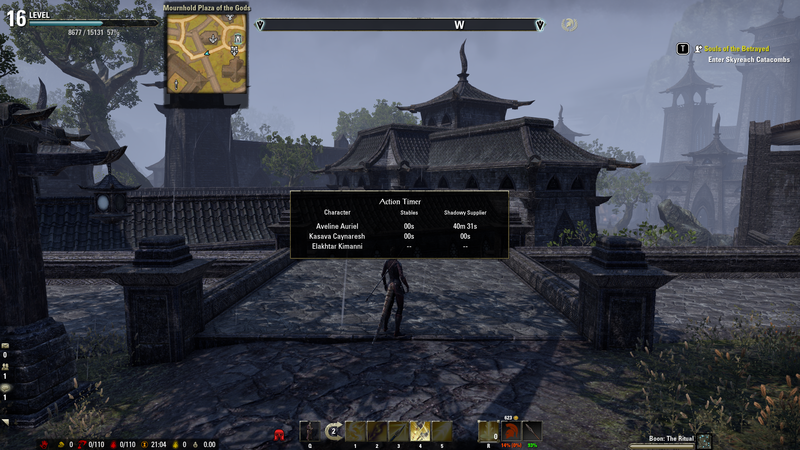 There aren't any real settings in the addon menu, yet, as this is the first time I built an addon with a GUI and I'm not certain what the best design for UX would require to be able to toggle timers on a per character or account-wide basis. That said, if you go into your keybinds and bind a key to Action Timer to Toggle the Window, you'll be able to see the current timers for your Characters at this time. The first time you log in to a Character, it will calibrate the timers, so you'll have to load each Character once to get a full list. I have more information in the description of this addon as of now, so it's a little less confusing. Also, the Donation button is set only for in-game Gold. If you like this Addon because it saves you time, builds your skills quickly, and/or increases your crafting materials in-game, shoot some appreciation mail to @PositronXX.